It should come as no surprise that horror games have already begun to take the virtual reality world by storm. The ability to get up-close and personal with terrifying monsters and creepy scenarios without leaving the comfort and safety of home is intoxicating for horror fans. Although the technology is still quite new and has plenty of room to improve, there are already several strong VR horror games on the market. Whether you’re looking for an atmospheric exploration of a spooky new world or want a heart-pounding monster-slaying adventure, these VR horror apps and games offer a taste of what’s currently available. Below are our top picks for scary VR games. This Oculus Rift horror game is a psychological thriller set in the 1940s. The game relies on an intensely spooky atmosphere and engrossing story to draw players in, and it works well. Visually, this is a stunning game. The black-and-white graphics help to build the authenticity of the 1940s narrative, and a compelling cast of characters helps to bring the story to life. A lot of VR horror games sacrifice story for gimmicks and jump scares, but Wilson’s Heart offers genuinely engaging gameplay while seamlessly incorporating VR elements. Another Oculus Rift game, Dark Days is a psychological thriller in the same vein as the X-Files or Twin Peaks. The game is set at an eerie motel in the desert, and it soon becomes clear that things are not what they seem. Your goal is to complete puzzles and explore your environment in order to solve the mystery of what’s going on. This adventure game is puzzle-based and very accessible to anyone familiar with the action-adventure genre. Although it does make heavy use of the jump scare technique, the story itself is spooky and engaging in its own right. Layers of Fear is already one of the better known and popular terrifying horror series, and this interactive version ratchets the experience up to a new level. Like the original game, Layers of Fear: Solitude puts you in the shoes of a master painter who is going slowly insane. You get to walk through his lavish Victorian home as you look for clues to solve the mysteries of his life, but you will be plagued along the way by haunting visions and dark secrets. The game is available through the Google Play store for any Android-compatible device, and as one of the most affordable games on our list, it’s a great way to get your toes wet with scary VR games. Fans of the original Until Dawn game will be delighted by the visual style and storytelling prowess of this game. However, go into it knowing that this is not a sequel. While Rush of Blood has some stylistic similarities to the original Until Dawn title, the story, setting and game mechanics are entirely different. Until Dawn: Rush of Blood is a PlayStation VR game that straps you into a terrifying roller coaster ride through a horrific carnival environment complete with evil clowns and many other things that go bump in the night. The rail shooter mechanics give you a simple objective: you need to shoot as many targets as you can while hurtling through the carnival. This allows you to rack up points and upgrade your weapons. This is another well-known horror game that’s been re-tooled for interactive VR play. This is a game that is best played with Vive or Rift technology that will let you take advantage of the dual lens view. If you’re already familiar with the Alien: Isolation game, you can expect a very similar experience in VR as in the traditional PC game. The game is set in the Alien franchise universe. You play as Amanda Ripley on board the Nostromo, searching for information or clues about your mother’s whereabouts. In true survival horror fashion, you’re unarmed and must face the challenges of this sci-fi horror game with your wits rather than muscle. This PlayStation VR game is intensely atmospheric and a refreshing breath of fresh air for people bored with playing the same well-known horror titles. In Here They Lie, you enter a drab sepia-toned dreamlike world filled with vague foreboding. Your lover is the only bright thing in the world, but you can’t quite seem to catch up with her. Your journey through the game world is a psychologically intense jaunt underscored perfectly by a haunting soundtrack. This is the type of game that doesn’t seem like it should be frightening until you delve deep into it. Once you’ve experienced it, though, it will stick with you. This indie game gained popularity a few years ago when an early version was played by popular YouTube streamers, and the fully remastered VR version is every bit as terrifying as the desktop game. In Monstrum, you play as a person who has awakened on a derelict cargo ship where something terrible has recently happened. You are the only survivor left alone with a monster. You must get off of the ship before the monster has a chance to catch up with you, but it won’t be easy. This is a procedurally generated roguelike escape game with heavy replay value. There are three monsters and multiple ways to escape the ship, and the environment is randomly generated each time. You won’t know which monster is coming for you in any given play-through until you reach your first encounter, giving this game a white-knuckle intensity even after several play-throughs. Dreadhalls is one of the oldest VR horror apps on this list. It’s been terrorizing people since 2013, and it’s widely available for PSVR, Oculus Rift, and HTC Vive. This immersive dungeon-crawler sends you through a dark underground dungeon filled with unnerving surprises. Armed only with curiosity, you must make your way to safety by hiding and moving quietly so as not to wake the evil that lurks there. Roguelike elements mean that this game will be different each time you play it. This gives it plenty of replayability, which is always a welcome feature in a low-cost game. If you want a heart-pounding zombie survival game that puts you in the center of the action, this is the game to play. The Brookhaven Experiment is available on PSVR, HTC Vive, and Oculus Rift, and its swift action makes it a great party game choice to show off your VR capabilities with all of your friends. Unlike some of the quieter and more atmospheric games on this list, The Brookhaven Experiment thrusts you right into the action. You must arm yourself to fight waves of the undead, but be prepared for the difficult boss fights. With 360 degree views and immersive sound, this brings you as close to the zombie apocalypse as you can get from the safety of your living room. This interactive horror VR game replicates the experience of walking through a haunted house. Relying on jump scares and psychological suspense built through a super creepy atmosphere, this game sends you deep through the titular manor filled with creepy sights and lurking evil. Thanks to the plethora of in-your-face horror moments, Affected is a popular choice for streaming, and it’s fun to play in a group so that you can watch your friends jump and shriek in horror. With its low price tag and availability across Oculus Rift and Google Play products, this is a fun entry point to VR horror genre. You wouldn’t think that something called “Chair in a Room” could be terrifying, but this game will prove you very wrong. As the name might suggest, you begin this game waking in a chair in a room, unable to move or interact with the world around you. Unfortunately for you, your environment swiftly turns horrifying. You become the unwitting witness to all manner of horrors in the darkened room. One of the best parts of this game is its price tag: a free app, this is the perfect horror game to try on your Google Cardboard or Daydream View for a high-quality horror VR experience without a costly investment. If you’d prefer, there’s an extended version of the game called A Chair in a Room: Greenwater that takes advantage of HTC Vive’s technology. You can also play it on the Oculus Rift. This creepy game sends you on a train ride through the underworld. You help to guide other passengers into the beyond as you experience the otherworldly ride together. Along the way, you have mysteries to uncover and plenty of environments to explore. One thing that helps Manifest 99 stand out is its visual design. The game eschews the photorealistic visuals of many other games in favor of a painterly style resembling a storybook. As you explore and talk with your companions, the story unfolds in a gripping narrative. This game is available on PlayStation, Oculus, and Steam, and it’s one of the few games on this list rated at E for 10+, which goes to show that even kid-friendly games can be spooky. If you want a safe but thrilling experience for a younger player, this is a good introduction to VR. The goal of virtual reality is to eliminate barriers between you as the player and the game world that you’re experiencing. It differs in this way from augmented reality, which strives to bring aspects of the game into a version of your real surroundings, usually by taking advantage of your smartphone camera. 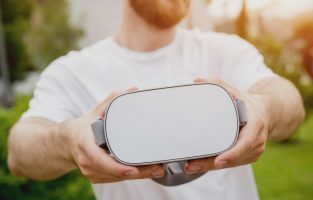 VR tech has exploded in popularity since around 2010 when the prototype of the Oculus Rift was initially created and crowdfunded through Kickstarter. Since then, multiple other products have come onto the market offering versions of the same experience. The simplest of these VR headsets are simply there to hold your smartphone in place in front of your eyes while you experience an app. The high-end VR sets incorporate headphones, hand controllers and headsets to provide a full-body immersive experience. To get started with virtual reality, you’ll first need to choose your gaming platform. 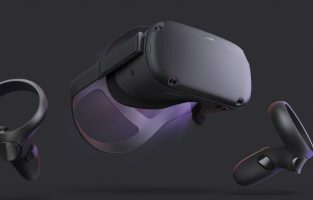 VR options exist for PC, console and mobile games, and picking a headset compatible with your platform of choice ensures you’ll be able to play the games you like. Oculus Rift: The first commercial VR headset, the Oculus Rift is designed for use with a PC. Its earliest versions were compatible only with high-end gaming machines, but newer models are more accessible. HTC Vive: Made through a partnership with Valve, the maker of Steam, Vive is the biggest competitor to the Oculus Rift. 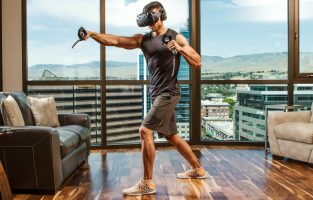 The Vive starter kit includes the headset, hand controllers and a movement-tracking base station that allows you to move while playing. Sony PlayStation VR: This system is made to accompany PS4 games and makes use of existing PlayStation accessories like the DualShock controller and PlayStation camera. If you’re a console gamer looking to get involved in VR without investing in a gaming PC, this may be the tool for you. Headsets made for mobile gamers tend to be more affordable but have fewer features. 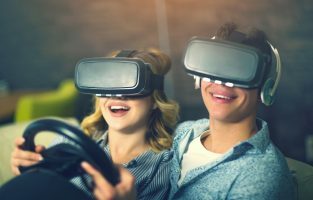 Since these VR systems use your mobile phone as both the gaming platform and the screen, your experience will be limited by the capabilities of the smartphone or tablet. 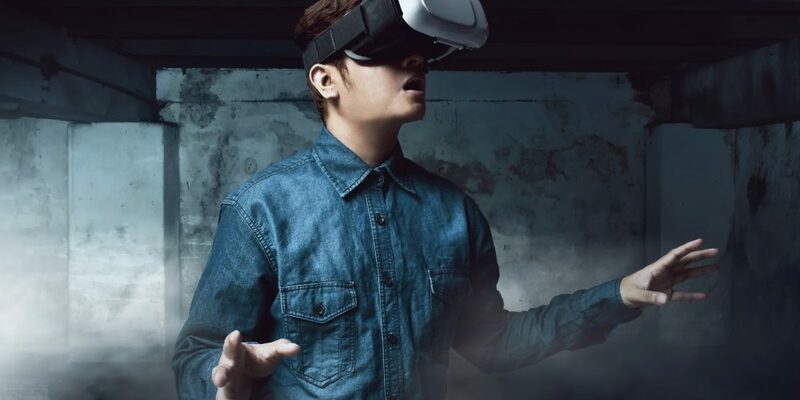 Once you’ve chosen your headset and platform, getting started in virtual reality is as simple as following the instructions for the headset you’ve purchased, downloading a game you’d like to try and jumping into the virtual world.